To run a Live or On Demand webinar directly on your own website or landing page, please follow the instructions below! Please note, before starting, you must have an event created within your WorkCast Account that has Slides or Media attached. If you are a Producer+ license holder you must ensure you add your domain where the embed code is being placed in your account. Important: Please add exactly as per the examples, you do not need to add http:// or https:// as part of your domain. For host users, please email support@workcast.com with your domain and we will add it to your account. 1. As a Host or Producer user, first log in to your WorkCast Account and navigate to the Events tab. 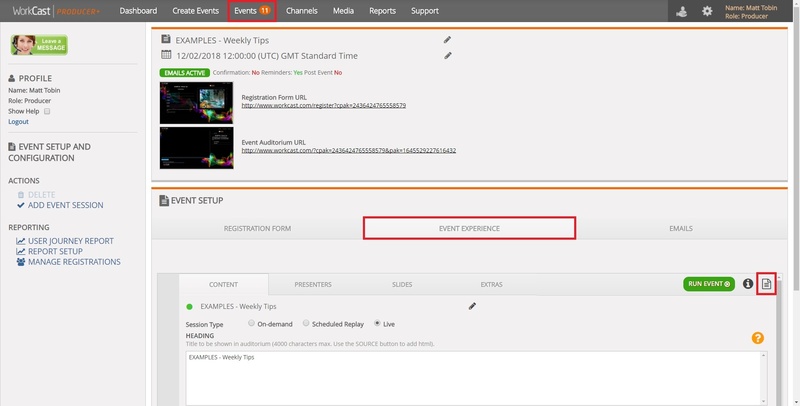 Locate the event you wish to embed within your website and click on it. 2. Head down to the Event Setup section and click on Event Experience. Look to the right of the section and you will see a Document Icon. 3. 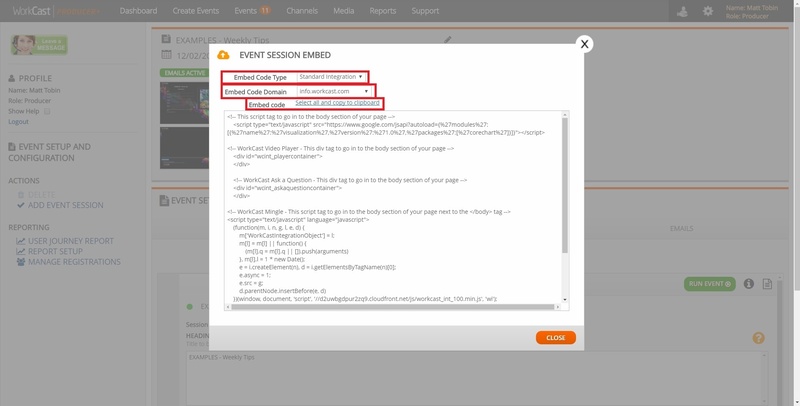 You will see a popup, titled Event Session Embed. Within this popup, first selected your Embed Code Type from the dropdown list, which will be either Standard Integration, or the Marketing Automation Integration program you have defined beforehand (i.e. HubSpot). 4. Next, select your Embed Code Domain and choose the domain you wish to embed on from the dropdown list. Please note, if no options appear in this list, please send a request to events@workcast.com with your required website domain address where you want the event to be placed. 5. Once you have chosen these two options, the Embed Code HTML will generate in the text box below. Click the Select all and copy to clipboard option and paste this into the section of your website you wish to embed your event. Your event should then appear within your website on the page you want! is populating attendees email addresses. To do this, you will need to generate a tag which will pull across the viewers' emails, showing that they attended your event on your website and insert this into the code on the website page you're embedding your event. This is because you're hosting it on your page and not a WorkCast-generated auditorium. Please note, if you chose HubSpot Integration, this will be done automatically. Therefore, you don't need to generate a tag.